The 39mm screw mount — also called Leica Thread Mount (LTM ), Leica Screw Mount (LSM), or (incorrectly) M39 (as it is not a metric thread) — was introduced by Leica with the model I (C), and used on all the Leica models until the IIIg. The mount was adopted on many Leica copies and other 35mm rangefinder cameras. 39mm screw mount lenses were also made for the early Zenit SLRs, which have a different film to flange distance (rangefinder lenses mounted on these cameras will not focus to infinity). The film-to-flange distance was not standardized on very early Leica (until 1931) and early Fed and Zorki (until the early postwar years). These cameras were individually matched to their lenses, by way of shims, and this may cause compatibility problems. We will attempt to make a list of 39mm screw lenses. These are arranged alphabetically by company name, or by brand name when the manufacturer is unknown. All the lenses in this list are genuine Leica mount lenses, or at least were advertised as such by reputable dealers. Today some merchants convert old and rare lenses into Leica mount. Please do not include these converted lenses in the list. See the main article on Arco lenses. Probably for military use only. See Canon 39mm screw lenses. See Corfield 39mm screw lenses. A 12"/7.7 Dallon Tele-Anastigmat has been offered for sale at eBay with a Dallmeyer prototype reflex housing. An Elionar Anastigmat 5 cm f/3.5 collapsible lens is known in Leica screw mount. It was made for the Sonne Italian Leica copy. Industar-26m 52/2.8. Available both with and without focusing tab. Fuji made Fujinon lenses in Leica mount in the 1950s or 1960s. See Fuji lenses for Leica and Nikon. The Isco Westar 50mm f:3.5, rigid with chrome finish, was the standard lens mounted on the prototypes of the Recta, a rangefinder variant of the Rectaflex. Industar-22 50/3.5 - a development of FED's Industar 10. Most commonly found in a collapsible mount, but also found in a rigid mount. Industar-50 50/3.5 - a further development of the Industar 10 + 22. Most commonly found in a rigid mount, but also found in a collapsible mount. Russar 20/5.6 - not rangefinder coupled, as the depth of field renders precise focusing unnecessary. See the main article K.O.L. and Sun lenses in Leica screw mount. The Italian optical company Koristka, based in Milano, made a Victor 5.5 cm f/3.5 lens in Leica mount for the Gamma, an Italian Leica copy. It is marked F.lli KORISTKA for "Fratelli Koristka". See the main article on Kowa lenses for other cameras. The Prominar 7.5 cm f/3.5 and 7.3 cm f/3.5 for Leica dating from the late 1940s are not marked as made by Kowa. They are actually similar to the Sun Sola, and were certainly manufactured by Sun or its predecessor. See K.O.L. and Sun lenses in Leica screw mount. A Kristall Krinar Anastigmat 50mm f/3.5 collapsible lens is known in Leica screw mount. It was made for the Kristall Italian Leica copy. Made by Kyōei under the Acall brand. To be done in a separate page. The Lena-Q.C 5 cm f/3.5 collapsible lens ostensibly made by Lena Kōgaku was mounted on the Chiyoca camera (see the description there). Showa Kogaku, better known as Leotax, apparently made their own lenses for their very first Leica copies, among which the rare Letana Anastigmat 50mm f/3.5 (see this Leotax page at Cameraquest). 3.5 cm f/3.5 Rokkor, chrome, 4 elements/3 groups, marked "CHIYOKO"
5 cm f/2.8 Super Rokkor, chrome, 5 elements/3 groups, marked "CHIYOKO"
5 cm f/2 Super Rokkor, chrome, 7 elements/4 groups (Summitar type), marked "CHIYOKO"
5 cm f/1.8 Super Rokkor, black, 6 elements/5 groups, marked "CHIYODA KOGAKU"
8.5 cm f/2.8 Super Rokkor, chrome, 5 elements/3 groups, marked "Chiyoko"
11 cm f/5.6 Tele Rokkor, black and chrome (all chrome also made), 4 elements/2 groups, marked "Chiyoko"
13.5 cm f/4 Tele Rokkor, chrome, 4 elements/3 groups, marked "Chiyoko"
The Altanon 5 cm f/2, ostensibly made by Misuzu Kōgaku, was mounted on the Alta camera made by the same company. It was actually a rebadged version of the Tanar 5 cm f/2 by Tanaka. An Altanon 5 cm f/3.5 was also announced but perhaps never sold; it was certainly a continuation of the Lena-Q.C and Reise-Q.C. See the page on the Alta for more details. Made by National Optical Company, based at Leicester,England, NOC was a 'daughter company of Taylor,Taylor & Hobson which was also located in Leicester and created to deal with high product demand during WW2.. The Trinol lens head is made by National Optical Company and marked as such in fine print, but has no maker marking. Made by Nippon Kōgaku, predecessor of Nikon. See the main article Zuiko 4cm f/2.8 for Leica. See the main article on Supreme lenses. Orion Seiki and later Miranda Camera also made the Mirax reflex housing in 39mm screw mount. The Reise-Q.C 5 cm f/3.5 collapsible lens made by Reise was mounted on the Chiyoca camera (see the description there). Riken, predecessor of Ricoh, announced the Riken No.1 Leica-type 3×4 cm camera in 1938; its Riken 50mm f/3.5 lens perhaps had an interchangeable Leica mount, but nothing is confirmed so far. The camera was finally released as the Gokoku; it normally has a fixed lens, but at least one example is known with a Leica-mount Ofunar 50mm f/3.5, which was perhaps not made by Riken but by Tomioka or Ōfuna. Finally, the Neutar 50mm f/3.5 lens mounted on the Ricohl IIB normally has a slightly different screw mount, incompatible with the Leica, but at least one example is known in standard Leica mount. See Gokoku and Ricohl for these three lenses. The British optical company Ross made some lenses in 39mm screw mount. The Xtralux range was released together with the Reid British Leica copy. See the main article on the Rojar 3.5cm f/3.5 for Leica. Schneider made some lenses in Leica mount very early, before World War II. They also made special lenses ordered by Leica. Shōwa Kōki made a single lens in Leica screw mount. See Piotar 4.5cm f/1.9 for Leica. Steinheil made some lenses in M39 mount. It was essentially the optical range developed for their own Casca model. They were all in chrome finish. Some of these lenses also existed with a Tower engraving on the barrel, to be sold with a Sears Tower Leica copy. 50/2 Quinon, 6 elements/3 groups (Sonnar type), close focussing to 18"
Steinheil also made lenses for the Braun Paxette, with a 39mm diameter screw mount, not compatible with the Leica rangefinder because the flange to film distance and rangefinder coupling were different. A 50/2.8 Triplar collapsible lens has been offered for sale at eBay, as a prototype lens. The Prominar 7.5 cm and 7.3 cm f/3.5 have no manufacturer's name, and are almost identical to the Sun Sola 7.5 cm f/3.5. See the main article on Tanar lenses, with details on each lens. Made by Tanaka Kōgaku, originally sold for the Tanack Leica copy. The Altanon 5cm f/2 sold by Misuzu Kōgaku on the Alta is a rebadged version of the Tanar 5 cm f/2. Taylor, Taylor & Hobson made the collapsible 2" f:2 Anastigmat as the standard lens for the Reid British Leica copy. They also made a rigid 2" f/2 Cooke Amotal Anastigmat lens for the Bell & Howell Foton camera. Some of them appear in Leica screw mount, due to Peerless(US) arranging for an Italian firm to mount them in rather crude Leica screw mounts so that they could fit them to Leica camera imports and undercut the Leica camera prices fixed by Leitz, who could only fix the prices of Leica cameras fitted with Leica lenses. See Tōkyō Kōgaku lenses in Leica screw mount. The Lausar 5 cm f/4.5 and 5 cm f/3.5 collapsible lenses of the Lausar and Baika cameras are certainly interchangeable with Leica screw mount. The Ofunar 50mm f/3.5 found on a Gokoku with Leica mount was perhaps made by Tomioka too, or by Ōfuna (see Gokoku and Ricohl). In the late 1950s, Tomioka was certainly the supplier of the Yashinon and Yashikor 5 cm lenses offered by Yashica on the Yashica YE and YF. It might also have supplied the 50mm Honor lenses (see the discussion there), and there is a report of a Tominon C 50/1.8 lens in Leica screw mount, said to be "similar to the Honor lens" by Zuihō. A Trixar Anastigmat 50mm f/3.5 collapsible lens is known in Leica screw mount. It was made for the Wega Italian Leica copy. Voigtländer made some lenses in 39mm Leica mount. They are very rare and sought after. A Wega Anastigmat 50mm f/3.5 collapsible lens is known in Leica screw mount. It was made for the Wega Italian Leica copy. Yasuhara made a Yasuhara MC 50/2.8 lens for the T981. It was rigid, in chrome finish with a focusing bar (you can see it in this page of the Ichrizuka site by Madam-san). Phenix made a Phenix MC 50/2.8 lens for the Phenix JG50, an evolution of the Yasuhara T981. It was a four element collapsible lens, always in chrome finish with a focusing tab. The small Japanese company Y.K. Optical from Yokohama made two wide angle lenses in Leica mount. They were sold under the names Kobalux, Avenon, Pasoptik, Bower or Adorama. See the main article Rojar 3.5cm f/3.5 for Leica. See Zeiss 39mm screw lenses. See the main article on Honor lenses. See Zunow lenses for rangefinder cameras. ↑ See for example this forum thread at kyphoto.com. This page at Sovietcamera discusses lens compatibility on early Fed and Zorki and says that "The Leica screw mount is 39mm × 26 tpi (threads per inch) thread of the screw-mount Leica. All the Soviet cameras with 39mm screw mount are the same as Leica." ↑ This page by Andrew Yue. ↑ This page at Sovietcamera. ↑ Awano, pp.124–5 of Kurashikku Kamera Senka no.32. ↑ Awano, p.122 of Kurashikku Kamera Senka no.32. ↑ Awano, p.124 of Kurashikku Kamera Senka no.32. ↑ HPR, Leica Copies, p.414. 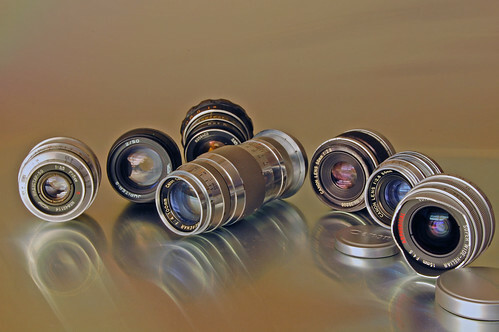 Compatibility page in Dante Stella's website, with a description of the differences between Soviet-era and Leica-standard lens focus mechanics. Fed-1 at Sovietcamera, with comments on the compatibility between the early Russian and Leica lens mounts.